Modulo pienamente compatibile con lo standard USITT DMX512-A. Retrocompatibile con il vecchio standard USITT DMX512/1990. Facile configurazione tramite porta USB. L'applicazione per PC e' scaricabile gratuitamente. 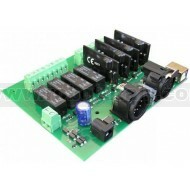 La foto mostra la versione 4 relay/4 dimmer. Power can be connected to the module either from a 9v AC transformer to the two pin screw terminals, or from a 9v AC adapter. If you are not using the dimmer relays then you can use 12v DC instead, the module cannot be powered from the USB port. The 120 ohm terminating link connects an on-board 120 ohm resistor across the DMX, this should only be fitted to the last module on the DMX cable. Remove the link on ALL other modules. The default factory settings for your DMX-USB-RX-RLY8 module is DMX address 1 and all relays set to on/off mode. The threshold level for on/off is 128 with a hysteresis of 3 . If the level goes below 127 the relay will turn off (open). If the level goes above 129 the relay will turn on (closed). Levels 127 to 129 do nothing, to protect against any jitter from the faders. If this is what you need then just connect the 9V AC or 12V DC supply, plug in the DMX cable and your away. It's more likely that you want to select a different DMX address or to change one or more solid state relays to dimmer mode. To do this you will need a PC running Windows 2k/XP/Vista. The USB driver for windows. Unzip the DMX_RLY8 Installation file into a temporary folder and click "setup" to install it. Next install the USB driver. If your using Vista, temporarily disconnect your computer from the internet by unplugging the network cable or switching off the wireless connection. This is because Vista will go off and look for a suitable driver and not offer you the chance to direct it to the correct driver. It will probably install the wrong driver. Disconnecting the internet first will force it to ask you where to look. XP is fine, it asks you anyway. Connect the 18vac supply to the module, then plug in the USB cable. Windows should detect the new module and ask for the driver. Direct windows to the "inf" file and windows will install the driver. Once installed you will have a new serial communication port listed in Device Manager. Run the DMX_RLY8 Configuration program, and you will see the following dialog. Select the new comm. port and it will find the module and display its software revision number. The DMX address the module is currently set to is displayed and if the module is receiving DMX, the levels are also visible. To select Dimmer mode for any relay, just check its tick box and click the update button. You should only do this where a solid state relay is fitted to the module. Doing this on normal mechanical relays will just cause them to chatter continuously. To use Dimmer mode you must also supply 9VAC to the module. 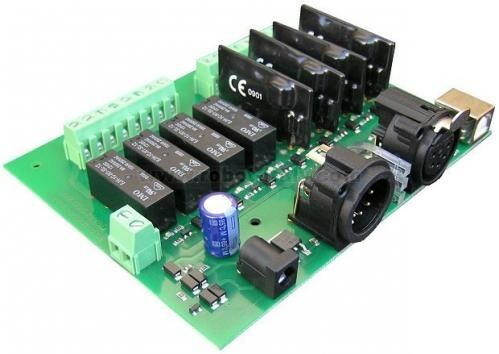 If you use a DC power supply the module will revert to normal relay mode. The DMX address can be set to any between 1 and 505. Just enter the new address in the "DMX Address" edit box and click the "Update" button. The 8 channels on the DMX-USB-RX-RLY8 module are numbered consecutively. If you select address 505, then channel RLY1 will be at address 505, channel RLY2 will be at address 506 and channel RLY8 will be at address 512. The 5-pin XLR connections follow industry standard pin-out. If the module is the last one on the DMX cable, you should ensure the link is fitted on the board. This will enable the 120 ohm terminating resistor. Where the DMX is feeding through to other modules further down the cable, this link should be removed.